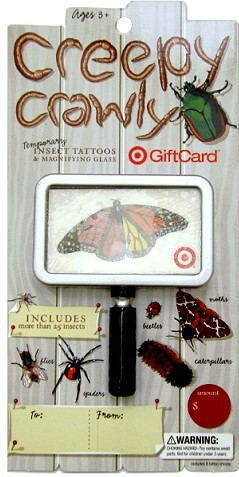 My kids love tatoos and bugs! I would so use this on diapers for my newborn coming next month! Already liked you on Facebook!!!! I am new to your website just starting to try to get into using coupons. I know I can save with them, but I’ve never had the time or discipline, but I am expecting my first baby in May and I am hoping to use this time to begin using coupons! So cool my eyes are bugging out!! Since I am new, I just liked your Facebook Page. Thanks for the help in getting started using coupons! I already “like”/ LOVE your fb page!! Thank you for the opportunity … this would be so wonderful to win ! Oh my daugteer would love that card. I have never seen that one! I’m hooked on your blog which my sister-in-law introduced me to. Keep up the awesome info!!!! Your great, thanks for the giveaway! I follow TT on facebook. THANKS! just went on FB, I likey too!!! Love your site & would love to win this!!! Would love to win! Thanks for all your work for us Target junkies! I’m a liker on FB!! I ‘love’ you on facebook, as well! Thanks for the weekly giveaways. I love you on Facebook too!